(CNS): Schools update — Government schools reopened on Grand Cayman Wednesday but as rains turned heavy on the Sister Islands schools there closed. Officials said staff should report for work unless flooding prevents them from doing so and external exams will go ahead as planned. Local forecasters have called for more heavy showers Wednesday and police warned boat owners to stay out of the water. Inspector Tahal of the RCIPS Marine Unit advised all vessels to exercise caution, to avoid venturing out into open waters and to seek safe harbour where possible. Scattered showers and overcast conditions were expected to continue until Wednesday evening and weather experts warned of further flooding. All government schools were closed Tuesday and both UCCI and ICCI cancelled their evening classes. However, officials confirmed that both government and private schools were expected to open Wednesday provided there were no flooding problems. 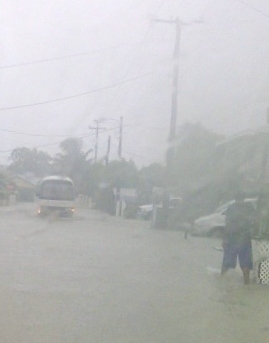 "Based on the latest weather forecast we anticipate that government schools will be able to open (Wednesday) provided that weather conditions remain stable," the education ministry stated. "However, weather conditions may change without notice and the public is encouraged to closely monitor public announcements until this weather system passes." The forecast calls for overcast skies with widespread showers and some thunder, especially over the Sister Islands. Some showers may be locally heavy and lead to further flooding of low-lying areas. Temperatures will fall to the upper 70’s. Winds will be south to southwest 15 to 20 knots with higher gusts in and around showers. On Wednesday cloudy skies and showers will continue with further possible flooding of low-lying areas. Temperatures are expected rise to the low 80’s. Winds will be south to southwest 15 to 20 knots with higher gusts in and around heavy showers. The outlook calls for a general decrease in cloudiness and shower activity from Wednesday evening. In the meantime, seas will continue to be rough with wave heights of 4 to 6 feet, especially along the south and west coasts. Small crafts should continue to exercise caution over open waters. You complain if there is rain and flooding occurs, and schools are closed for students. You would have complained if the schools hadn’t been closed and there was flooding. You complain because we have new classrooms built at the primary schools. You would have complained if the new classroom blocks hadn’t been built and students left in poor learning environments. Where are all of you bloggers when there are PTA fundraisers, volunteers needed for reading days for children, clean up days for the Islands and afterschool program assistance? If the majority of negative bloggers got off their butts and donated 50% of their blogging time to assist in the much needed areas of student lives, volunteer programs and ways in which to improve the lives of themselves, their families and others we would live in a more positive environment. An Island with less hate, bad mind and road rage. Try being positive no matter how bleak life appears. Try to speak about the positive outcomes that can be achieved. Visit your local school and sign up as a volunteer to read to a child, help with an after school programme or coach some after school extra curricular activity. Come on people, positive thoughts, positive speech and positive actions will bring positive results. My goodness, what messages are you sending to our children………complain, complain & complain, that’s all life is about. Really?? Be Positive, Pray before you Blog! Ask God to help us to be Positve and not Negative. And if you don’t like to pray then just make a positive change within yourselves. SKOOL IS OUT,,,,,,LETS PAAAARTY!!!!!!! !……be carefull drivin home though. I had to laugh at the number of status updates I saw on facebook on Sunday about how 'God is good for providing the rain' 'showering us with blessings' etc etc. These have slowly died a death as the rain continued and the flooding started. I see no status updates on fb now about how God is to blame for the flooding… you can't have it all ways people – or maybe, just maybe, it is not god at all, but simply a weather system passing across…shock, horror! I know that Exhalted Leader has said that he would get things his way come hell or high water – well one of the two has arrived. The rainy season is same time every year. Clear the drains in a timely fashion. Be proactive. I believe we can expect more of these types of bad weather events in the coming months and, if we live to see it, years. God has taken note of the godless ways of our people and the ex-pats we have in our midst and is punishing us for it. Who can doubt this is true with all the storms, fires, and earthquakes we have seen in recent times. It is time to repent and beg the Almighty for forgiveness before it is too late for us and our beautiful islands! Hurricane season is the same time each year. Be proactive and clear the islands' drains in advance. Its 8AM Wednesday, no teachers at BT primary or kids. Sad, our kids cant learn because of rain or people afraid of water. If people are flooded, they will be forced to stay home and employers will understand, period. Closing schools is not a "snow day" for anybody and helps no one. The CI Govt had better get this right before June 1st Hurricane season. We had pathetic weather forecasting from the Government this week with no apologies or acountability and I'm curious as to what did the Hazard Management office say? or was no-school day a phone call amongst cronies? Parents must call in sick or arrange child care, children have enough holidays already and anyone that argues our kids can afford more time off school has not seen the test scores lately! Give people credit to decide not to drive through dangerous roads, the whole 10% of them may not make it to school or work, bugt the rest (90%) of the children and half (parents) the workforce should not suffer for a "snow day". Once again…the people of this island blaming thier hardships on Government ….they even blame the weather on Government…I'm sorry but wouldn't you rather your children be safe? Are boat owners being warned to stay out of the sea, or the streets? Hey Dude is it still raing? Anyone got a kayak for sale? ’twas a nice day for school today. Lovely learning weather. Some people really write stupid comments.